Global boiler market size in 2017 was valued over USD 50 billion and annual installation is anticipated to exceed 13 Million Units by 2024. Growing energy demand in conjunction with pervasive investment across the industrial sector will stimulate the global boiler market size. Emerging economies across Africa and Asia-Pacific have introduced various progressive programs toward the installation and upgradation of the existing boilers, which in turn will positively impact on the industry growth. For instance, in 2017, PT United, Kansai Electric Power and Sumitomo Corporation announced a collaborated investment of over USD 4.4 billion for the upgradation of Tanjung Jati thermal power plant in Indonesia. Introduction of building energy code along with increased spending toward expansion of urban centers will drive the residential boiler market growth. High efficiency, synchronization with home automation system and reduced breakdown risk are some of the prominent features of modern heating systems which will boost the product demand. Government measurers towards minimization of carbon footprint across commercial establishment has resulted in increased spending toward upgradation of existing facilities which will in turn stimulate the demand for energy efficient boilers. 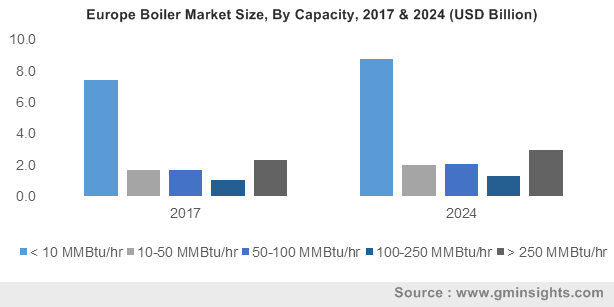 <10 MMBtu/hr boiler market is projected to surpass USD 19 billion by 2024. Ongoing infrastructure spending across residential & commercial sector coupled with rising demand for space heating from cold climatic regions will boost the adoption of low capacity heating units. For instance, EU, in 2015, invested over USD 760 billion toward development of housing infrastructure. Rising investments toward power generation capacity expansion to mitigate the demand-supply deficit will fuel the > 250 MMBtu/hr capacity boiler market growth. These systems are primality deployed for steam generation across thermal power plants and steam intensive industries. Developing economies across Asia-Pacific and Africa including India, Indonesia, Malaysia and South Africa have introduced plans to improve industrial productivity and expand the power generation capacity. For instance, in 2018, NTPC Ltd. announced the commissioning of two 660 MW units in India. Global water-tube boiler market revenue is anticipated to grow over 3% by 2024. Ability to attain higher temperature coupled with high pressure handling capacity by employing superheaters makes it a preferable option over its available counterparts. Quick response, lesser weight, low radiation loss and high operational flexibility will further boost the product demand. Natural gas boiler market in 2017, was value over USD 16 billion. Low carbon emission, high efficiency easy stocking and ample availability of natural gas makes it a favorable option over its other counterparts. Government legislatives toward promotion of energy efficient technologies and reducing air pollution coupled with the efforts toward enhancing energy security will further drive the product demand. Progressive targets to enhance the power generation potential across developing areas including Asia Pacific and Africa along with increasing investment in metal and cement industries will drive the coal fired boiler market growth. In May 2018, Kenya signed an agreement with General Electric (GE) toward ultra-critical clean coal technology based 1050 MW thermal power plant in Lamu. Growing concerns over carbon emissions along with increasing demand for energy efficient space heating solution will boost the residential boiler market growth. Respective governments have introduced regulations and policies toward the promotion of energy efficient heating solutions. For instance, the Federal Energy Management program has set a minimum efficiency of 95% for gas fired residential and commercial boilers with a capacity of 0.3 to 2.5 MMBtu/hr. Commercial application in 2017, accounted for over 25% of global boiler market share. Growing government expenditure toward the development of infrastructure including institutions, offices, colleges, hotels and healthcare facilities is set to drive the business growth. In 2016, the U.S. government expenditure on healthcare reached USD 670 billion, growing by 3.6% from 2015 level. 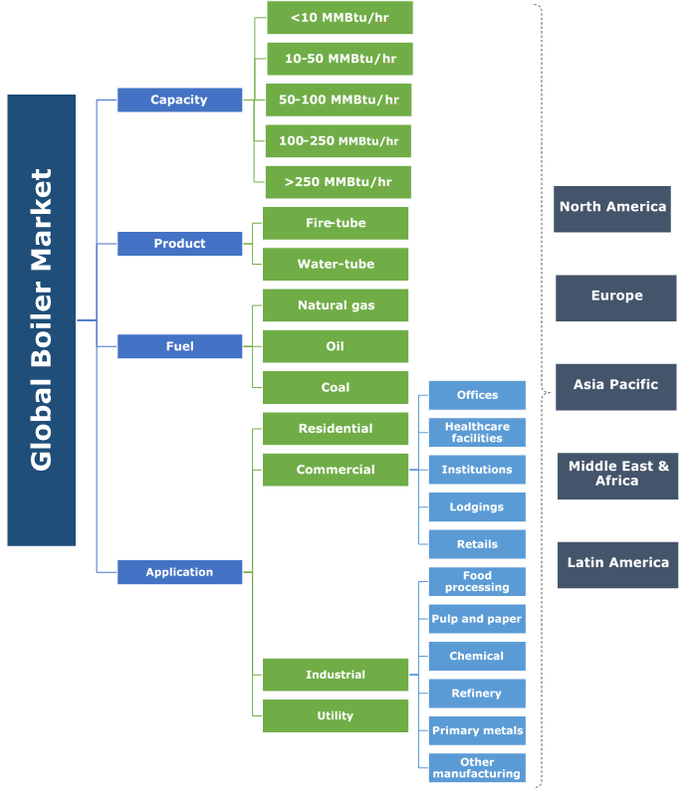 The U.S boiler market is anticipated to witness growth on account of robust investment activities across commercial and industrial sector. Ongoing replacement of existing heating systems with modern heating solutions to comply with the rigorous legislative emission standards will further augment the product demand. Under the Clean Air Act, Environmental Protection Agency has set the emission standards for different air pollutants including carbon monoxide, lead, nitrogen oxides, sulphur dioxide and particulate matter. China boiler market is predicted to grow on account of growing investment across bulk chemical, food processing and metal industries. In 2015, revenue from chemical market exceeded USD 1,300 billion accounting a growth of 12% from 2014 levels. Rising energy demand in conjunction with growing fuel prices is further set to drive the industry growth. Key players operating across the boiler industry comprise Bharat Heavy Electricals, A.O. Smith, Parker, Cleaver-Brooks, Thermax, Weil-McLain, Fulton, General Electric, Babcock and Wilcox, Forbes Marshall, Burnham, Hurst Boiler and Welding, Cochran and others. Major industry participants are focusing towards design innovations and expansion of product line as part of strategy to meet the regulatory standards and enhance the market presence. Furthermore, boiler manufacturers are undertaking M&A activities to expand their global footprint. Boilers are majorly employed for steam generation and hot water applications across commercial, industrial and residential sectors. Growing need for space heating across residential and commercial establishments along with sturdy development across industrial sector will fuel the product demand across the globe.